This Tweet is widely recognised as the “first Tweet on Twitter”, and it is unquestionably the earliest Tweet surviving in public view. But there are some fascinating geek facts surrounding the oft-retweeted submission. For a start, it was not posted by a human being, and as we’re about to see, it was almost certainly NOT the first ever message posted to the service. WHEN IS A NUMBER ONE NOT A NUMBER ONE? When it’s a number 20… The first question mark over the “first Tweet on Twitter” is encased in its Status ID. Every Tweet has within its URL a unique Status ID code, which increases chronologically with each new message posted. One would expect the very first Tweet posted on the Twitter service to be number one. But @jack’s “just setting up my twttr” Tweet is not number 1. It’s actually number 20. And subsequent visible Tweets do progress chronologically in terms of Status ID. The next one is number 21, the one after that is 22, and so on. So unless for some bizarre reason the Status ID counter started from 20, rather than from 1 or zero, the very earliest chunk of Twitter activity is missing. The Status ID system suggests that there are at least 19 Tweets – the FIRST 19 Tweets on Twitter – that we can’t account for. What happened to those Tweets, or twttr updates, as they were known at the time? There could be a variety of reasons why these earliest Tweets didn’t survive. The reasons could relate to technical issues, or brand image management, or privacy… There are lots of possibilities. We know that @jack not only has the oldest surviving Tweet on Twitter, but also the oldest surviving account. He opened the account one minute and twenty-nine seconds before @biz (Biz Stone), and the earliest surviving Tweet was posted immediately upon account creation. Interestingly, the kick-off of the service, forward from @jack’s Status ID 20 message, looks contrived. Several accounts open in extremely quick succession, each marked by a setup Tweet. There’s a definite “launch” feel to it, even though no one was really watching at the time. So maybe the team just had a firm eye on the future, and historical presentation, and took the decision to delete any test accounts that destroyed that feel of a concerted launch? Could the missing Tweets have been test messages, from one or more test accounts? Well, if that is the case, it’s hard to work out why Twitter didn’t zero the Status ID counter after the test period, so that the first meaningful Tweet could be number 1. All Twitter accounts have a unique User ID, which advances chronologically in the same fashion as the Tweet Status IDs. So the @jack account is account number 1, right? Wrong. It’s actually number 12. Numbers 0 to 11 return a “Sorry, that page doesn’t exist!” error. So once again, if the count started from zero, we can see that there wasn’t just one test account before the current @jack – there were, logically, at least 11 separate accounts. That’s a lot. We have, then, a ratio of (probably) 19 missing Tweets, from (probably) 11 missing accounts. We can be pretty sure that those accounts were either testers, or deleted versions of the core staff accounts (because who else but core staff would be creating Twitter accounts at that stage?). It seems unlikely that as many as 11 test accounts would have been opened AFTER the ID counters were zeroed for launch, or that as many as 11 test accounts would have been required for a series of only 19 test tweets. So no, the missing activity doesn’t look like official testing. It looks like an aborted launch. So what else do we know about the early moments of the embyonic Twitter – or twttr, to quote the spelling of the original app? Between Status 20 (the oldest surviving Tweet) and Status 29 (the oldest surviving live human Tweet), there’s a predictable succession of “just setting up my twttr” messages, which correspond to the creation of the staff accounts as they appear. You can cross reference the Tweet times with the account creation times, and they match. It’s this that tells us the messages cannot possibly have been posted live. There wasn’t the time between account creation and the posting of the messages for a human to have typed them. Three Status IDs between 20 and 29 are missing, but they look certain to have been repetitions of the same auto-introduction message – “just setting up my twttr”. For example, the @jeremy account appears between the creation of @crystal and @tonystubblebine, whose account creation Tweets are Status-numbered 23 and 25. Status ID 24 is missing, so it’s almost inevitable that it was a “just setting up my twttr”, auto-posted and then deleted, by @jeremy. @ev’s account creation corresponds to the missing Status ID 28 in a similar way, and there’s a totally deleted account which was created just before @ev’s. That deleted account would logically have auto-Tweeted the missing Status ID 27. Therefore, @jack’s “inviting coworkers” (Status 29) definitely looks like the first live-posted Tweet after the start of the currently visible office ‘launch’. But since the 11 missing accounts with older User IDs than @jack’s would not likely have produced more than 11 account creation auto-Tweets, it’s also a virtual certainty that Status 29 was not the first live-posted Tweet ever. 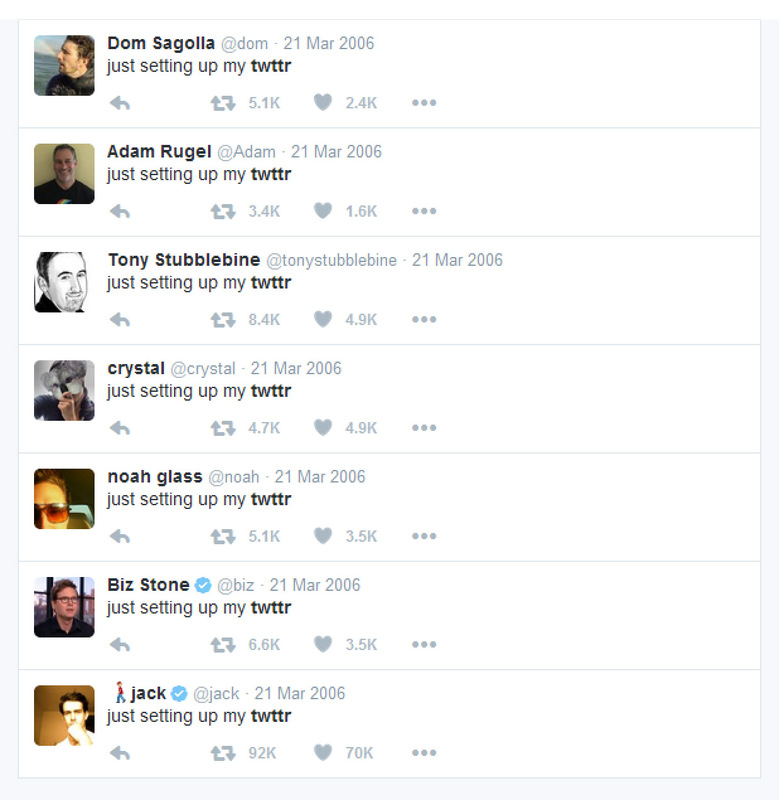 Some of Twitter’s hidden test accounts, that shaped the site as we know it. WHY WAS THE ABORTED LAUNCH ABORTED? If the aborted office ‘launch’ theory is correct, why was the whole thing deleted? What makes it so hard to explain is that we’re not talking about the deletion of one or two Tweets, or one or two accounts. We’re talking about the deletion of 19 consecutive Tweets, AND the 11 consecutively created accounts that must have posted them. Everything! Seemingly, this was not a minor “Oops”. This was a very major “Okay, we need to wipe out all trace of what’s just happened, and start again”. One possibility is that the auto account creation Tweet didn’t exist at all when the earliest 11 accounts were opened. Perhaps a mini office ‘launch’ was implemented without any automated message, and because a number of staff members had manually posted something like “just setting up my twttr”, someone thought it would be cool to hardwire that particular status into the account creation process? This would certainly have fuelled a desire for key staff members to open new accounts. And in order to carry forward their desired usernames, and avoid any sense of account duplication, their original accounts would have to be deleted. That would also have wiped out their original Tweets. It’s a theory that makes a lot of sense. But is there any evidence? Nothing categorical, but we do know that after a couple of days the auto account creation message was changed from “just setting up my twttr“, to “just setting up my twitter“. This tells us that plans were very fluid, and implies that the account creation message probably hadn’t been considered in much depth. On balance, the last minute introduction of an automated account creation message seems the most likely explanation for the restart that appears to have taken place. We may never know what really happened, but what we can be fairly sure of, is that we should be referring to Tweet Status ID 20 as the “oldest surviving Tweet”, and not “the first Tweet on Twitter”. Previous PostWhy Most Timewasters Are MaleNext PostDirect Message Read Receipts: Another Desperate Mistake For Twitter?